Were it not for a hugely successful ad campaign for Dos Equis, actor Jonathan Goldsmith would probably be sailing the Caribbean. Or perhaps tending to animals in New England. Or simply having lunch in Marina del Rey, which is where I met him. He is instantly likable, approachable, and welcoming, all gentlemanly qualities echoed by his character for Dos Equis' ads, "The World's Most Interesting Man." But Goldsmith also exudes a quiet cool. Perhaps this is where the distinction between he and his character can blur, as they both seem to possess the innate ability to transfer their aura onto the things around them. Sipping on the beer that's made him a pop icon, Goldsmith imbues the bottle with his charm, and suddenly a little Dos Equis with lunch is the coolest thing in the world. Goldsmith spoke of roles large and small throughout his long career in show business, from television to film. A notable expression of "What if?" came over his eyes as he spoke of one of his numerous acting credits, Go Tell The Spartans, a film about Vietnam which had the dubious luck of being about released shortly before Apocalypse Now. The roles began to dry up, and with it came semi-retirement. Luckily for us, his new life of traveling, business dealings, sailing, and climbing the Sierras would prove insufficient for Jonathan, ever eager to return to show business. With the help of his manager (and wife) Barbara, he was able to land a role targeting a demographic typically ill-suited to have an older spokesman. And so it came to be that a pretty interesting man, with the help of the right woman, became the world's most interesting man. The young writers tasked with crafting the mythology of The Most Interesting Man In The World rave about Goldsmith's ability to ease into even the tallest of tales. He's been known to cure narcolepsy just by walking into a room. His blood smells like cologne. He lives vicariously through himself. A falconer? Rescuing a bear from a trap? Leading a search expedition that includes legendary saxophone player Pharoah Sanders? Sure, it all works! Goldsmith, like the World's Most Interesting Man, has many varied tastes and activities, particularly with food and drink. He likes Nate & Al's deli. He likes Umami Burger over Father's Office, but if he's being honest, Cheesecake Factory makes his favorite burger. He is equally at ease with a snifter of armagnac as with a Bloody Mary. He actually prefers Dos Equis Amber. But sometimes it's his most innocuous interests that will disarm the casual observer. As often happened over lunch, conversations ran into tangents, and the subject of raising a coop full of chickens came up. Goldsmith, his charm contagious even to himself, sat in rapt fascination over talk of eggs and caring for hens. He is the World's Most Interested Man. The ad campaign strikes a chord with people whose drinking habits are as dynamic as their personalities. There is nothing absolute about the character's endorsement, nothing final. Truthfully, the endorsement barely even begins. 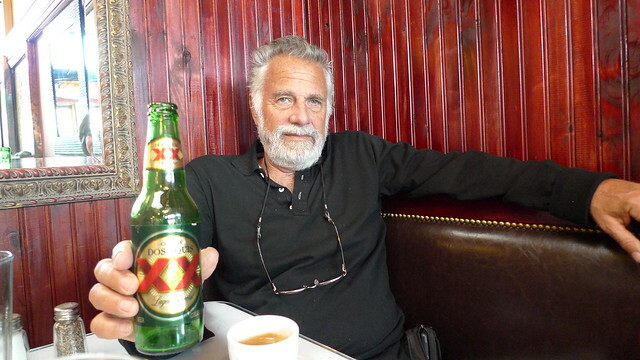 "I don't always drink beer, but when I do, I prefer Dos Equis." Paradoxically, eschewing the need to chase trends has successfully created them, and Dos Equis has enjoyed a boom in sales as many of its competitors falter. In the same manner that Old Spice re-asserted the role of a masculine aspect (in their case, bravado) with men's body wash, so too does Dos Equis link a masculine aspect (in this case, sophistication) with beer. Lunch ends and coffee is served. Sipping on an espresso, Jonathan is still the coolest guy in the room. He's the living symbol of one the ad's greatest triumphs: the celebration of one's own good taste.